Continuing the milestone initiative commenced in January 2018 to eradicate a vital national menace, the sustainable waste management solutions provider INSEE Ecocycle Lanka Ltd. (INSEE Ecocycle) once again joined hands with the Sri Lanka Police (SLP), Police Narcotics Bureau (PNB) and National Dangerous Drugs Control Board (NDDCB), Government Analytical Department (GAD)and President Task force for Drugs Prevention to responsibly dispose confiscated Cocaine Hydrochloride through Cement Kiln co-processing for the second time in Sri Lanka. In January 2018, the company disposed of 928 kg of confiscated Cocaine using the same technology taking the first forward step to resolve the problem. 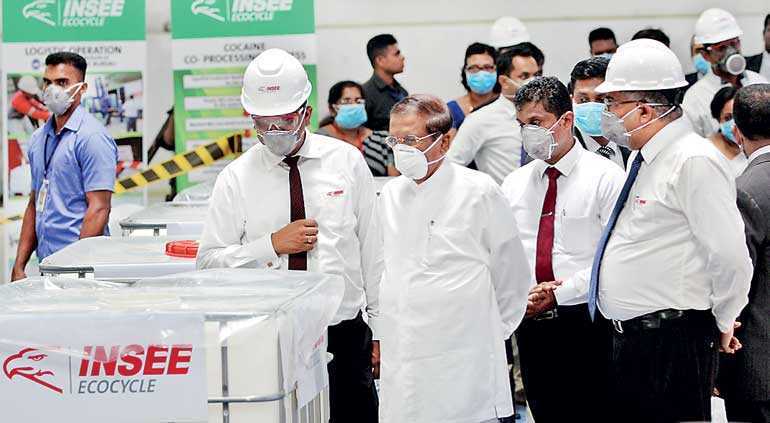 This year, the first phase of the process will be held on 1 April at DNS warehouse, in Gonawala, Kelaniya under the patronage of President Maithripala Sirisena and the supervision of PNB, NDDCB and Sri Lanka Police, Government agencies and industrial experts involved in the process of confiscated cocaine disposal through co-processing will also be present. The cocaine material was confiscated by PNB, followed by the verification of the narcotic material under the guidance of Government Analyst Department (GAD), NDDCB and Attorney General’s Department. He further said: “However, feasibility of destruction of other illicit drugs such as Heroin, Cannabis, other narcotic drugs and psychotropic substances including new psychoactive substances using the same disposal procedure is under the laboratory investigation at the NDDCB. In addition, the NDDCB works on providing scientific recommendations, coordinating, supervising and monitoring of the disposal of court samples along with the Police Narcotic Bureau and other drug law enforcement agencies for fighting against the problem of drug trafficking and abuse in the country.” INSEE Ecocycle has carried out the technical evaluation with the support of PNB and NDDCB on feeding mechanism and pre-processing activities for safe disposal of the dangerous drug whilst minimising the social and environmental impact. The technical evaluation included a comprehensive risk assessment and mitigation action plan covering all the aspects of environmental, social, health and safety areas throughout the pre-processing, logistics and co-processing value chain to ensure safe and secure disposal. PNB Deputy Inspector General Sajeewa Medawatte said: “INSEE Ecocycle successfully carried out the first ever cocaine disposal in a scientific manner with proven cement kiln co-processing in 2018. 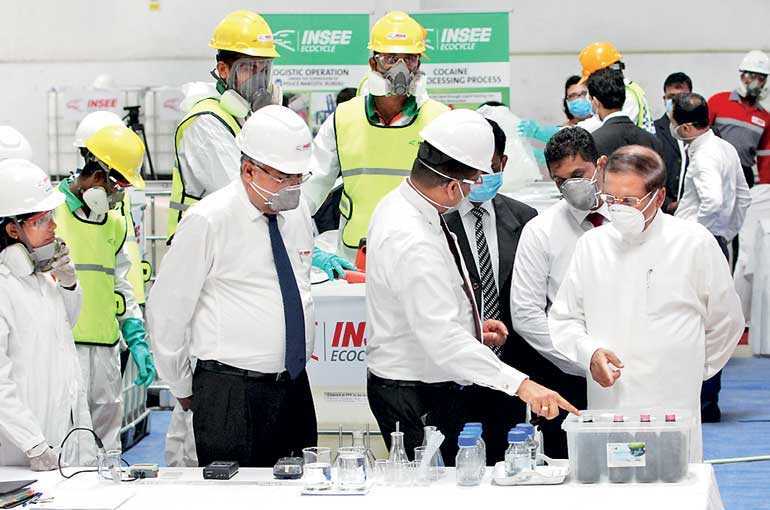 We have experienced their technical knowhow, systems compliance and state-of-the-art infrastructure and are happy to join hands with INSEE Ecocycle for the safe disposal of confiscated cocaine,” he said. There are several ways of waste feeding mechanisms available at the Cement Kiln co-processing facility. The confiscated Cocaine Hydrochloride will be co-processed through liquid feeding channel, which enables closed feeding with minimum exposure to the environment, while ensuring the 100% security for materials considering its high risk and social sensitivity. The confiscated Cocaine will be liquefied in an aqueous medium. The pre-processing will involve a conversion of the chemical structure and the physical state of the material. As per the calculated ratios in pre-trials, material will be dissolved in water ensuring zero residual remains. For visual differentiation of the material, a colouring agent will be added. In order to verify the process, confiscated materials and the process were pre-tested on 29 March at NDDCB laboratory under the supervision of SLP, and PNB as per the court orders given at Magistrate courts of Mount Lavinia and Aluthkade. The liquefied material will be transported for final disposal to Puttalam Cement Plant where the second phase of the disposal will take place on 1 April. This material is transported via intermediate bulk containers using GPS enabled, specially built hazardous waste transporting vehicle with secondary compartment to prevent spillage as a proactive emergency preparedness. The entire operation will be carried out under strict supervision of Sri Lanka Police and the transporting vehicle will be escorted by the SLP and PNB officials. The disposal will take place through Cement Kiln Co-processing by using the existing temperature of 1800- 2000 with 4-6 sec, residence time and under full controlled parameters of the kiln process. INSEE’s Co-processing facility satisfied all regulatory requirements, technical standards and is globally adopted for the management of waste and it offers a complete solution with zero harmful emission to the environment. The facility has obtained all required licenses (Environmental Protection License and Scheduled Waste Management License from Central Environmental Authority and Provincial Environmental Authority) and certifications such as, ISO 9001, ISO 14001, ISO 17025 and OHSAS 18001.